The 2019 Doctors' Day Greeting Card is here! "Thank you . . .for your dedication to the care of others. Happy Doctors' Day"
National Doctors' Day is held every year on March 30th in the United States. It is a national holiday on our calendars to celebrate the contribution of physicians who serve our country by caring for its' citizens. The first Doctor's Day observance was March 30, 1933 in Winder, Georgia. Eudora Brown Almond, wife of Dr. Charles B. Almond, decided to set aside a day to honor physicians. This first observance included the mailing greeting cards and placing flowers on graves of deceased doctors. On March 30, 1958, a Resolution Commemorating Doctors' Day was adopted by the United States House of Representatives. In 1990, legislation was introduced in the House and Senate to establish a national Doctor's Day. Following overwhelming approval by the United States Senate and the House of Representatives, on October 30, 1990, President George Bush signed S.J. RES. 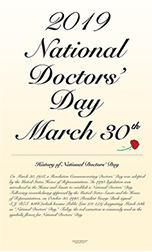 #366 (which became Public Law 101-473) designating March 30th as "National Doctor's Day." Order your Doctor's Day gifts and decorations today, supplies are limited!